Long ago in France, it was custom for villagers to throw buns into a pile of preparation for the wedding feast. A clever baker decided to take some bun-like pastries stuffed with cream and fastened them as a pyramid, like the mound of buns, creating a tall cone of caramel-coated cream puffs called croque en bouche “crisp in the mouth”. The cone may be topped with caged doves, which are released to symbolize the newlyweds’ departure from their families The Croqueembouche is a traditional French wedding & christening cake, also called “Piece Montée”. The shelf life for this type of cake is ONLY 1 DAY; the cake will be made 2 hours before pick or delivery day of the function. 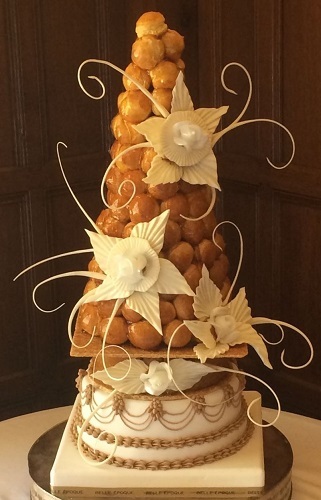 The Croqueembouche is a traditional French wedding & christening cake, also called “Piece Montée”. A long time ago in France, it was a custom for villagers to throw buns into a pile in preparation for the wedding feast. A clever baker decided to take some bun-like pastries stuffed with cream and fastened them as a pyramid, like the mound of buns, creating a tall cone of caramel-coated cream puffs called Croqueembouche “crisp in the mouth”. The cone was topped with caged doves, which are released to symbolise the newlyweds’ departure from their families.